Actually, I am excited about a lot of things. Well, more just feeling grateful for a lot of things. Sometimes I find myself randomly drifting off and thinking about life. I always come away feeling amazed and grateful for everything I have, and just genuinely appreciative for my life, my family and the fact that all nine of us are healthy and together…well minus Creighton since he lives in Cleveland, but we miss him like crazy and hope he can find a job out here soon! I guess that I am going on about this now because I got a super mean comment the other day about how I am an ungrateful brat and that I should stop pretending to have a job and actually get a real one. And yes, those where his words. Two years ago, this comment would have knocked me down for days, but now I just think about how happy I am that I do not have to put others down just to make myself feel better, which my guess is exactly what “Jimmy Bob” was doing. FYI, it’s kind of not cool, and you really should not pass judgment on people until you know all the facts… and then some. Anyway, this mean comment just got me thinking about all the stuff I actually am so grateful for. Things like having a job that I LOVE, which YES is a real job because I spend almost every waking minute of my days working hard at. This beautiful new home/studio/barn of mine that is pretty much the space of my dreams. Sure things have been a little stressful, BUT I am so excited to have some space to actually work and concentrate AND it will be even better once all these workers are outta here (can’t wait). MY PARENTS who help me SO flipping much. People who say they do it all alone are just not being honest if you ask me. Help is something I have a really hard time excepting, but without help I would not be able to do all the things I am doing today. My mom’s the genius behind all the techie stuff for the blog and my dad’s the ULTIMATE kitchen cleaner. And yes, I do 100% realize how awesome it is that my parents actually want to help me out so much. THANK YOU. I am also so grateful for my family’s health. Thankfully none of us have any serious health issues, which is honestly one of my biggest fears. Feeling incredible thankful that at the moment all six of my brothers, little miss Asher and mom + dad are healthy as horses. <–this makes me smile big! I could go on and on (like hey I am so happy to live in the mountains where I can play in the snow and hike in my back yard every single day! ), but even just writing this all out made me feel so happy. Honestly, if you are feeling down or even feeling a little bad for yourself (it happens to all of us), you should write out all of the things you ARE actually thankful for. Look at the positives. It feels SOO GOOD. Oh my gosh, you guys?? Do you think I should quit cooking and become a therapist?!?! I mean wow, I feel like that was some really good advice up there. I didn’t know that could all come out me. Whoa! But ummm…..BIG NO on the therapist thing. That would just never be for me. I am the one who probably needs to go see a therapist. I mean, sometimes I spend an hour (or more!) plating food. That’s kind of weird. And what else. 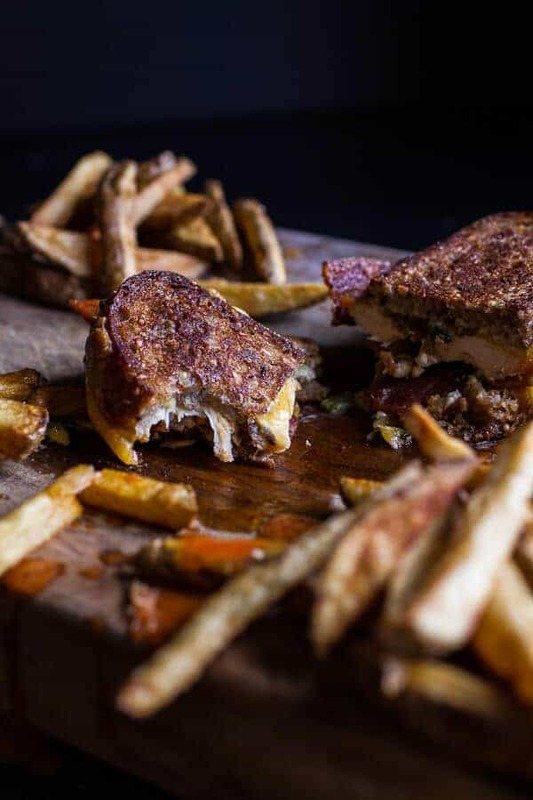 Yeah right, this big popper hot buffalo chicken and bacon grilled cheese! Like I said, I am so excited about it. 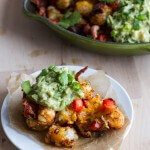 It’s a jalapeno popper and buffalo chicken marriage… and it’s beyond awesome! It’s also perfect for that big Super Bowl Game coming up. And speaking of the Super Bowl? I hope you’re ready for some good game day eats. I sort of went a little crazy this year, all next week there is going to be some serious football food. So all you guy readers out there, I really hope you decide to check in next week, because it’s going to be “guys week” for sure. But these sammies. They are loaded with an herb cream cheese mix, fire roasted jalapenos (which means broiled), spicy homemade buffalo chicken, bacon, cheddar cheese and blue cheese. 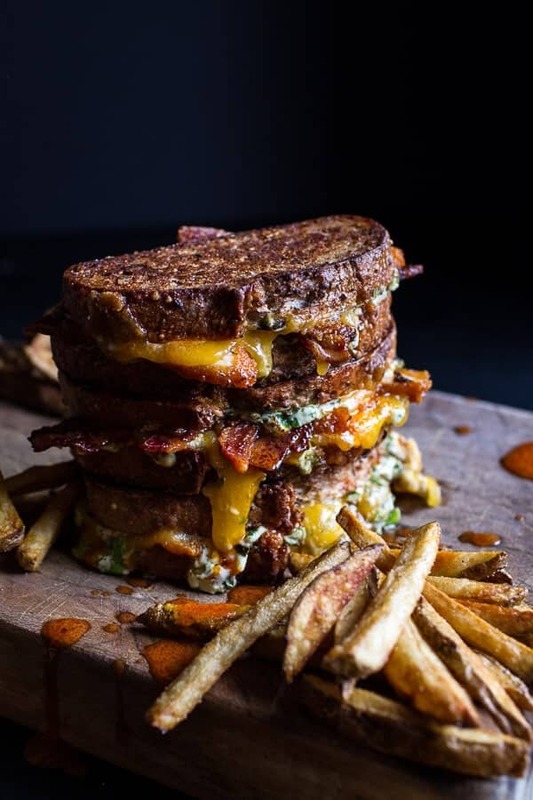 You see, I got a little carried away and since it’s Thursday, which means it’s practically Friday, this grilled cheese is totally acceptable. Sorry to all the dieters out there, this is not really healthy January food (this is a good alternative though for you!). My brothers made me, so blame them (way to accept responsibility, huh!). 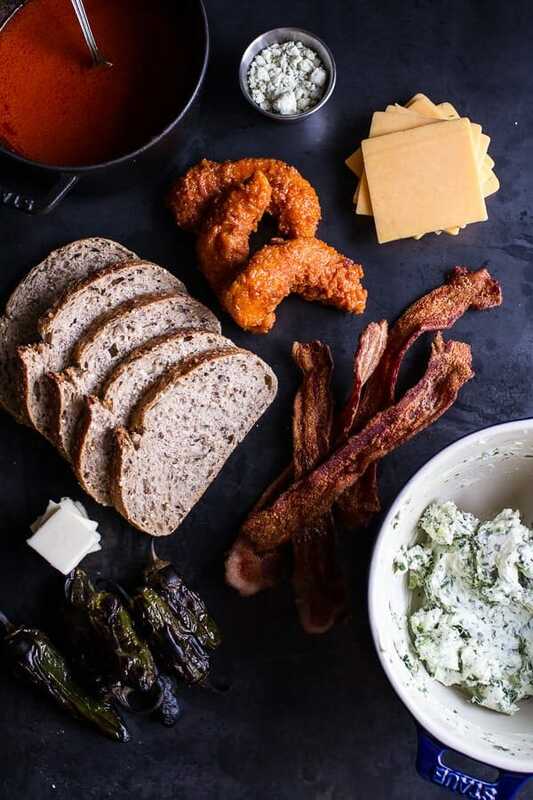 It's a jalapeno popper and buffalo chicken marriage... and it's beyond awesome! Heat the oil to 350 degrees F. in a deep, heavy-bottomed pot. Do not fill the pot more than 1/2 full with oil. Season the chicken with a little seasoned salt. Add the self rising flour to a shallow bowl or pie plate. In a medium size bowl, beat the eggs together. Once cool enough to handle, slice the chicken into strips. To make the sandwiches, preheat the broiler to high. 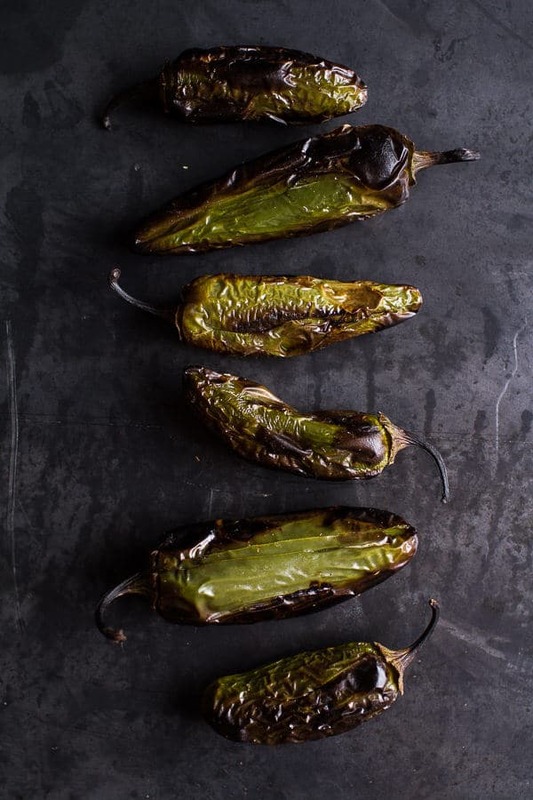 Place the jalapeños on a baking sheet (line with foil if desired) and broil the jalapeños until charred all over. Once charred, remove from the oven, allow to cool and then peel away a little of the charred skin (I like to leave some of the charred pieces on mine, I think it adds flavor). Seed the jalapeños if desired (or seed some and leave the rest with seeds). Chop the jalapeños. In a bowl, combine the chopped jalapeños, softened cream cheese, green onions, cilantro and garlic until smooth and creamy. Butter the outside of each piece of bread. 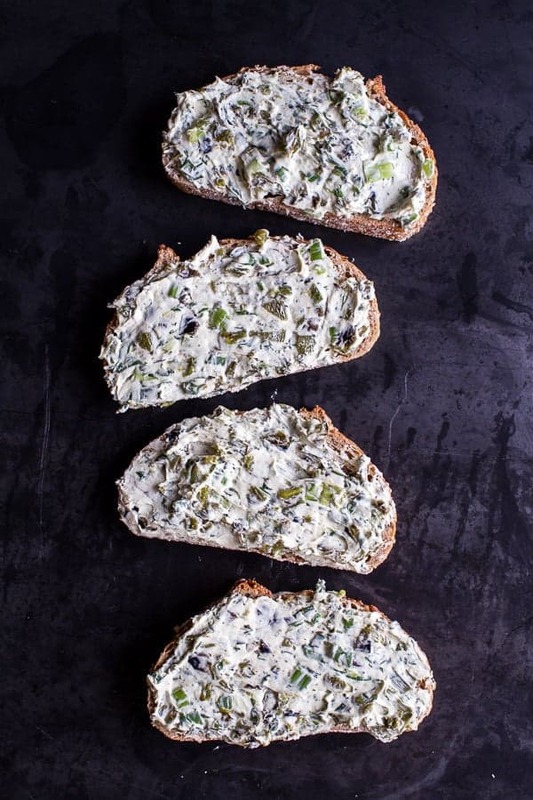 Spread the insides of each piece of bread with the cream cheese mixture. Top half the slices of bread with a slice or two of cheddar cheese. Top with sliced buffalo chicken + a drizzle of buffalo sauce, bacon and another slice of cheddar cheese. Sprinkle with blue cheese and then sandwich with the top half piece of bread. Repeat with the remaining sandwiches. Heat a large skillet or griddle over medium heat. Add a pat of butter and 1-2 sandwiches, cook for 3-5 minutes per side or until the cheese is melted and bread is crispy. Serve right away with ranch for dipping and fries for snacking!! *To quickly make you own buffalo sauce, mix 1/2 cup Franks Hot Sauce, 1/4-1/2 cup melted, salted butter and 1/2 teaspoon seasoned salt. *If you have time, or already have some roasted, I think that roasted garlic would be pretty amazing in this! Ahh yeah, thank them for sure! Totally agree ~ you have a job in your own right that is amazing and satisfying and you obviously enjoy because look at the awesome photography! How does food look so darn good? I’m sure you’re family is swelling with pride ~ I know I worry about my own kids and in a crazy way this blog reminds me that my kids just need to find the right niche for them as you have done, I shouldn’t worry or even necessarily push or want them to go to college if they find the right vocation without it! It’s exciting to see new job opportunities open like food blogging as a job, gives you hope for your kids future. And yes, I’m so glad you use Frank’s Red Hot Sauce, as a Buffalo gal, it makes me swell with pride!! Thank you!! finding your right niche is such a good feeling, don’t worry your kids will find it. I was extremely lucky to fall into this and realize I loved it so young. All your kind words have me smiling from ear to ear, THANK YOU! Hope you are having a great week and happy almost friday!! Oh and nothing is better than Franks, I never stray! Thank you so much, Hilary! 🙂 Your kind words mean so much! Dear Tieghan , you must not break down , NEVER ! You’re young and you’ve probably already found your way . I’m 26 years old and LIVE DREAMS , always . I know that life is hard , I live on my skin , but no one can afford to disrupt my life ! Well , after these pills of wisdom , I would tell you how good you are , these days I have tried several recipes and all your WOW , Fantastic ! BRAVISSIMA! WOW! Thank you for these kinds words, they mean so much!! You go girl–the best way to handle negative things in life is to go out and have a great life–your already working on that and your gracious enough to bring us along. Those pictures here show how hard you work. Oh I would love a bite of that sandwich right now but I’ll have to eat my oatmeal. Oh. My. God. Please invite me over! I will clean your stove, no your entire kitchen, no your entire house, and do the laundry and scrub the floors if you would cook this for me. . . . . nom, nom! 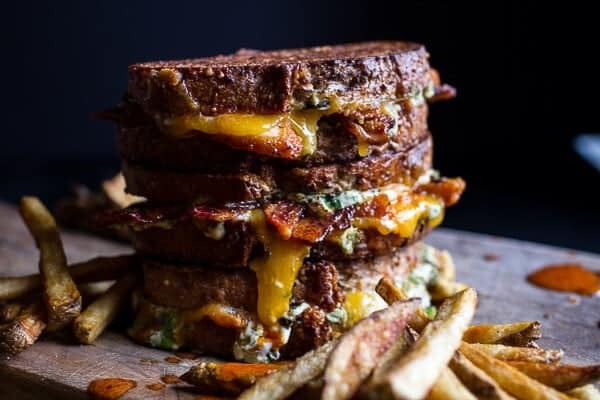 This sandwich is insane….I can’t wait to make it. I also can’t wait for the football food because the Superbowl is an official holiday in our house and I always take the day off after it to recoup!!!! A long time ago I realized that mean people say hurtful things because they don’t feel good about themselves it has nothing to do with us and in fact we should feel sorry for them because they aren’t as happy…No to the therapist keep doing what you’re doing because you ROCK at it. Thank you so very much, Lisa!!! All of your recipes look INSANELY delicious! This one is no different. You are so talented and thank you for sharing all of your stories and recipes. They are off the chart in my opinion. I look forward every day to see what you will do next! Keep up the great work!!! I love when you tweak a common dish and totally take it to the next level! This sandwich looks so amazing. Also, looking forward to your football food next week. My husband and I live in Italy so the Superbowl will be on late here, but I will definitely be making some of your recipes to celebrate early. Oh and whoever mentioned you getting a real job clearly has no clue how much time and effort is involved in this blog! You are so talented and hardworking, keep focusing on the positive vibes. When it comes to food, you can never get too carried away! That guy sounds like a jerk! Haha! No worries, I do not see that happening! Shaking my head at the guy’s comment. But so happy that you decided to not let it get you down! It’s so easy to assume things about one another and I love your comment about not passing judgement. But it is clear to me that you are an incredibly hard working individual! So grateful for your blog and all it’s wonderful inspiration! Wow, thanks so much for all these kinds words!! SO excited to hear I inspire you! THANKS! I want this sandwich to magically appear in front of me right now! It looks and sounds absolutely delicious! I will have to make one this weekend for sure. So glad you didn’t let that bozo’s comment get you down. Unfortunately, some people feel the need to judge others. It’s pretty obvious from reading your blog that you do work hard. Keep on doing what you do, it’s fabulous! 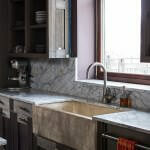 It should be clear to anyone reading your blog how passionate you are about food and cooking and that’s inspirational. For someone to try and knock down your passion just shows how unhappy they are in their life. Girl, you keep doing you because you have loyal followers and your recipes are AMAZING! I feel the complete opposite of Mr. Troll. 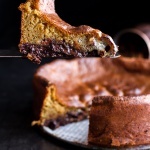 I’m incredibly impressed by & jealous of your mad food blogging skills on a regular basis. You’re a food blogging rockstar. You develop amazing recipes, perfectly plated so that they’re incredibly eye-catching, then take & edit beauuutiful pictures that make even the fullest person hungry. Anyone who’s never food-blogged has no idea how difficult, nuanced and time-consuming it is to do it well. I’m thankful that I have positive & talented food bloggers like you to admire. And also that I have your food to admire. Yum. Whoa! Thank you so much! Seriously these are such kind words, THANKS! Bravo to you Tieghan for taking a negative comment and turning it into something positive for yourself! You have my dream job – seriously! I’ve been trying for over a year to start a blog -with encouragement from my daughters and husband – but just can’t seem to take the leap. So congrats to you for doing what you love – and it shows through this blog! Also – this sandwich ??? totally awesome! Thanks so much, Kathy!! Your encouraging words are making my night! 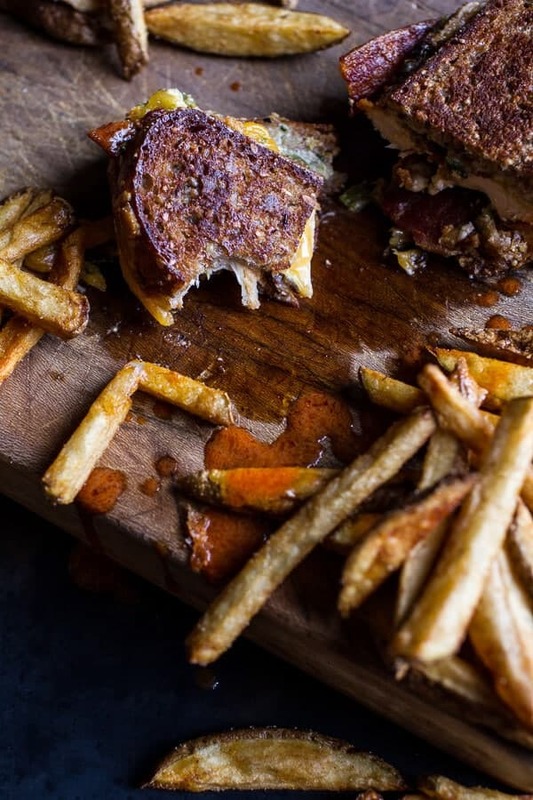 You can get carried away all you want, m’dear – these grilled cheesessss look amazing! Play them on repeat for Super Bowl Sunday, puh-lease and thank you! Sorry for the mean comment but you’re an amazing blogger and so inspiring! I love every bits and bites of your story and recipe. And I feel bad for that person. Like TS says, let’s just shake it off. And this grilled cheese is sooo bomb dot com! 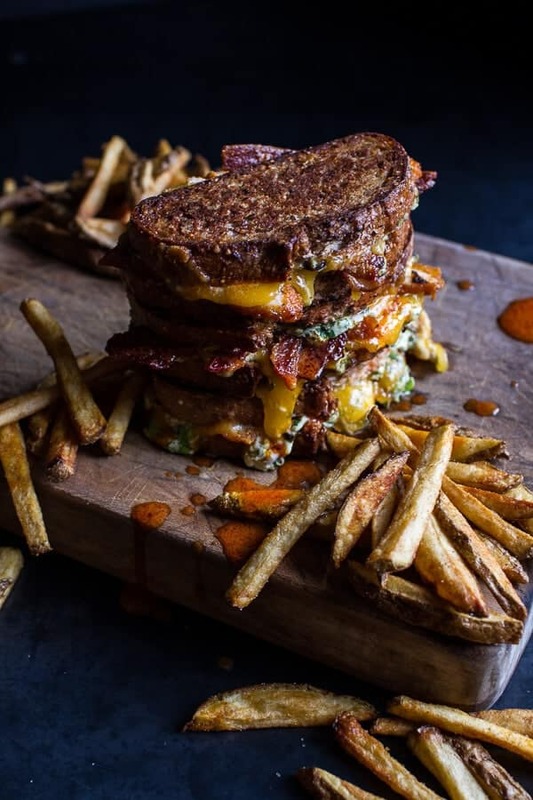 I’m just a regular fan of grilled cheese and I’m dying to try this one. HAHA!! I was just saying that TS song was perfect for this mean comment. HA! Gosh, I think this the best grilled cheese I’ve seen in a while! Gorgeous job! So sorry to hear about that nasty comment. I never understood people who actually take their precious time and write out something negative. Why on earth do hey do that? (I really hope it makes them happy!) And I’m so proud how you handled it. You go girl! Awww! Tieghan, you need a big hug for having someone say something like that! And then for you to be so cool about it just astounds me! I am daily amazed by the work you do, and I mean WORK! I spend my fair share of time in the kitchen and I know what it takes. I can’t imagine how much effort you put into every post. Okay, now let me say how stinkin’ bad I want to eat that sandwich! It may be your best yet and that is definitely saying something! Pinning! I have come to the same conclusion this week. After some disappointing news, I finally decided that letting myself feel bitter even a little bit is beneath me and regardless of if we are able to adapt our very special home that we love, but are bursting out at the seams or not, I have too many blessings to feel anything but gratitude for the gifts of my life. To paraphrase Victor Frankl “They can take everything away from me, but they can’t take my positive attitude” Good for you for you for your positive attitude of gratitude. Amazing how it can change things, isn’t it? At least it’s really comforting me. I’m always thinking to myself when I open your daily blog sent to me, which by the way, I’m thrilled to find when I come to work each day, because I realize behind it is a hard working gal. I find when people make mean comments, it is jealousy that drives the comment. Be kind to yourself and remember you are making a lot of people very happy not to mention building a career that is one of the hardest in the industry to crack. I find for someone your age to be so creative and hard working to be the norm of a lot of young people today, more people should realize this rather than make comments that the young are spoiled and only look for the easy way in life. I’m way over 60 and enjoy your blog more than any others for the energy behind it! Keep smiling as my dad would say, then nobody knows wheat your thinking! Nancy, thank you so much for these kind and encouraging words. Your comments means so much and put a smile on my fave, thank you!!! I am drooling just looking at the pic of this sandwich! I cannot wait to make this over the weekend! Yeah!! Thanks so much, Jennifer! Sandwich looks amazing! And those fries are the perfect ones for malt vinegar…yum! I always tell my young daughter…anyone who is a bully or says things that are for shock value, etc., inevitably has unresolved issues within themselves that have absolutely nothing to do with her. Glad you’re ignoring it and moving on. If you feel any emotion at all when these things happen, it shouldn’t be devastation but instead sympathy for the person who likely needs some type of support. Thanks so much and I could not agree with you more. Thanks for the kind words! Thanks so much, Stephanie! Hope you are having a great week! This looks delicious! Perhaps hard to get my mouth around but I’d be willing to give it a try 🙂 Thanks for posting – and your photography is beautiful! Oh my God 1) I have no words for how crazy, insane, awesome this grilled cheese is and 2) I cannot BELIEVE that guy’s comment! ARE YOU FREAKING SERIOUS? – He’s just jealous he doesn’t have as cool a job as you and that he would never be able to create such jaw droppingly delicious dishes (and photographs!) I agree with thinking about all the things you have to be happy about, it’s amazing that you’ve found your calling at a young age – means we have more years of seeing your dishes! Haha!! Thank you so much, Annie! Hoping you are having a great week and happy almost Friday!! Oh, yum, this looks so delectable! My brother and I were both swooning over it, mouths watering over your creative and delicious combo…love the idea…thanks for posting! No way!! I am NOT supergirl, but I know how you feel. I think that so many other other supergirls and I just fall flat. I think it’s human nature for us girls to feel like everyone is better, but the truth is everyones got their own issues, ups and down. You know? I will look at the food you make and think “I can’t imagine how much work went into that! Does she ever just take a Tieghan day?” We all know how hard you work because we can see it! Anyways, this sandwich looks so good and cheesy and spicy. Cheesy and spicy are two things that I have to have in my life pretty much every day. Super. What is accomying this sandwich. And then I cry because I have to wait until I’m home before I can make whatever you’ve made in my own kitchen. OHMG, thank you for all these kind words! SO SWEET!! 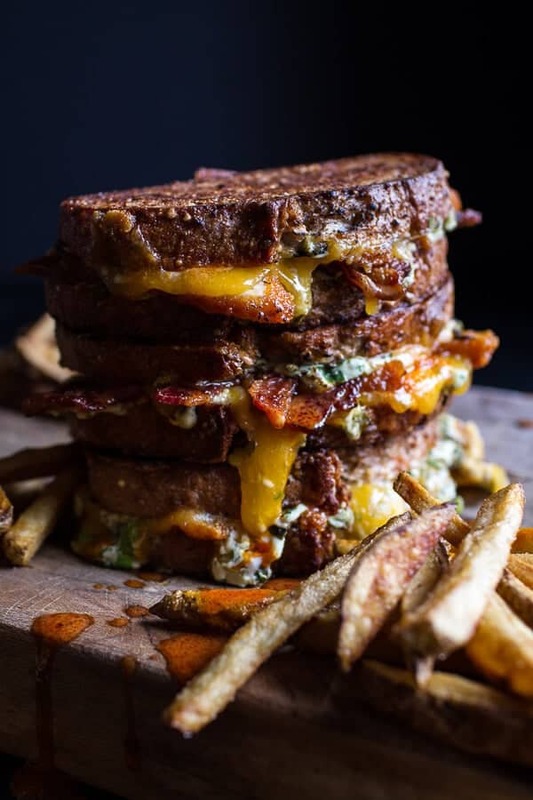 Girl, I’ve never seen a grilled cheese look better – you are killing it with this! And about that rude comment – I love your attitude and I so agree that reflecting on all the blessings in life is the key to facing anything. It’s not easy to take the high road but in the long run, it’s always worth it! It really is so worth it and you know, it feel so good too! Thanks so much, Laura! Happy almost Friday! Wow. How incredibly rude someone would say that to you! I honestly look at your blog everyday and think how incredibly talented you are. I have made MANY of your recipes and they make me and my family happy. Your doing great things. PLEASE don’t ever go “get a real job”. Also. I almost never comment on your post because I honestly think words don’t do your recipes justice. Thank you for sharing your passion with us! Thanks again and or commenting!! Hey! I have been a big fan of yours for a while now and have made several of your recipes and they always turn out soooo good! Your food photography is GORGEOUS!!! You have not only a knack for making delicious food – but also photographing it to make it look as delicious as it actually is! I’m sorry for the discouraging comment 🙁 Keep doing what you are doing – you’re so good at it! just OMG at this sandwich. I’m making it. Definitely. I can’t live with myself if I don’t! And also– CLEARLY this is a real job. I mean, look at those PROFESSIONAL photos you took. And everything that goes into the back end of this business… people just have no idea. You are awesome! I think you get carried away a lot…but it’s always so awesome to watch, and delicious. I think your blog is beautiful, I really admire your work, your writing and your creations. Good for you for not letting a childish comment from an obviously very bitter and unhappy person bring you down! HAH! Thanks so much, Jen! Have a great weekend! Tieghan I’m always amazed at your ability to turn something like a simple toastie into something completely delicious and extraordinary. I hope you give no more thought to the loser who left you the mean comment. I’ve also started blogging full time and even though it’s the best job in the world, it really is hard and time consuming work. You’re doing an absolutely superb job, and I always look to your gorgeous photos when I’m in need of a bit of inspiration. What a sad person he must be to attack a stranger on the internet.. Good on ya for not letting it get you down! Now to the matter at hand – that sandwich! I kinda wish I hadn’t read this post, I’m not going to be able to rest until I have that sandwich in my life. You’re a clever thing! This was unbelievably good!! My taste buds took on a life of their own, this concoction’s got one negative that I can think of, ITS HIGHLY ADDICTIVE!!!!! thank you 🙂 I’ll need to spend an extra 20 mins at the gym everyday though, totally worth it!! business, you have the means to improve your service delivery.
. Bookkeeping firms and bookkeepers also work with different forms and books in addition to software designed especially for serving this purpose. Don’t you dare quit cooking. Don’t do it. I just discovered your blog and, seriously, I can’t even… Stunning photos and incredibly interesting and delicious sounding recipes to match. Perfection. This recipe is AMAZING. i have made it 3 times this week. It is so much effort but SO worth it. I am supposed to be fitting into a bridesmaid dress in April so i better lay off, But it’s so hard! Franks sauce is the bomb. We live in Australia and for years a local restaurant made wings marinaded in a ‘secret’ sauce that we couldn’t get enough of. We found out it was just Franks sauce and desperately tried to import it! eventually we found somewhere local to buy it and it has been amazing! i am boring and don’t like strong tasting cheese so i used gouda. But my husband loved the blue cheese/cheddar cheese combo! And to all the haters, whatever! if you’re happy and successful you don’t need to justify yourself to make other people feel better. you’re clearly very gifted & even if you were mooching (which you certainly are not doing) why should anyone else be bothered? I’m so late in finding this recipe (via Pinterest) Tieghan. You know what? I’ve been a subscriber to your blog for some time (AMAZING recipes) but after spending some time on Pinterest I realised that whatever time of the day or night I was on there, you also seemed to be collecting recipes, styling tips and other things. Learning and creating material. Constant work. So, that said – I also just wanted to add my two cents here. I agree with other commenters that you must be one of the hardest working bloggers out there!!! Haters gonna hate (gettin’ my Tay Swift on!) but I think for the most part, people only say this stuff out of jealousy. Your work is getting recognised more and more, as far as I can see it, and your dedication is garnering massive amounts of respect both in the blogging community and outside of it! Keep it up and don’t let these people under your skin. Hi! This looks absolutely delicious! Can you tell what brand of bacon you used in these pictures you took of the recipe please? 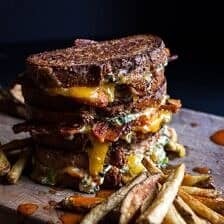 That deep color of that particular bacon looks amazing in this sandwich.. Thank you! I like to sue a thick cut bacon. I by it from the butchers counter, so no brand to note. Hope that helps! The food is very nice and inspiring appetite me. I just found you on Instagram and want to make everything. I’m having a girls luncheon in a month and was thinking of making these. Are there other soup, sides and desserts that would pair well? I’m not confident making fries…unless they are already frozen lol.